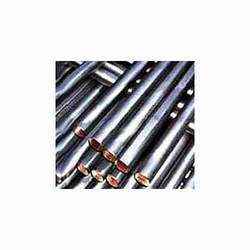 We supply a comprehensive and qualitative range of Monel 400 Round Bars. Owing to its features like corrosion resistant, wonderful finish, high tolerance and durability, our product range is suitable for various chemical and gas plants applications. Our products are in sync with the Industrial quality standards and are stringently checked on various parameters. The Monel 400 Round Bars exported by our company is in great demand in the international as well as domestic market. Our product range is highly durable and corrosion resistant, made of Monel400. These products are available in a gamut of dimensions, lengths, thickness and grades (Monel 400 (UNS No.4400) and Monel 500 (UNS No.5500)). These products are fabricated as per the ASTM / ASME SB 164 standard. Looking for Monel 400 Round Bars ?